Natural Center Oval Cut Peach Morganite.51cts. Color: Peach Clarity: Clean. Natural Side Round Cut White Diamonds.15cts. Ring Size: 7. Can This Ring Be Sized: (YES). WATCH HOW EVERYONE ADMIRES THESE STACKING RINGS. SET OF THREE STACK RINGS Red: Prong-set, pear-shaped ruby center; prong-set, round white diamond border in white rhodium plating; polished band. Blue: Prong-set, oval sapphire center; prong-set, round white diamond border in white rhodium plating; split crossover band. BAND IS 1MM THICK DESIGNED TO BE THIN SO THEY STACK. THESE ARE THE NEW STACK RINGS. Chrysoberyl Cat's Eye and Alexandrite are also two well-known varieties of that group. An exciting genuine, natural Chrysoberyl graces this scroll-designed. 925 Sterling Silver ring! That quality, combined with its unmistakable elegance, makes this ring one to own & enjoy! 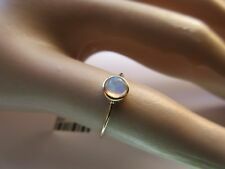 14KT SOLID YELLOW GOLD 4X6MM BREOLET PEAR CUT 50PT MOONSTONE STACK RING. BAND IS 1MM THICK DESIGNED TO BE THIN SO THEY STACK. THEY ARE 14KT GOLD VERY. Opal wt : 0.45 ct. 14K Yellow Gold : 1.25 gm (Approx). Diamonds Studs Gold diamond Rings Gold Diamond pendant Diamond Necklace. This ring available in all three Gold (Rose / Yellow / White). Birthstone Studs Solid Gold Jewelry Carving Earrings Beads & Findings. LIVELY, NATURAL EMERALD IN SOLITAIRE SET 14K W GOLD RING SIZE 6.5 (RESIZABLE)! Very Beautiful Solid Opal with play of colors. Natural Australian Solid Opal, Marquise Cut. Every Opal piece is Unique. You won't find two exactly identical opal gems because of their unrepeatable play-of-color. Under the center design is a lovely open design pattern that gives this ring a nice height and elegant design. The design on the top is followed by a polished white gold shank which makes this ring sizeable. Very High Grade Pearls. 14k Yellow Gold. Ring Size Natural Stones Yes, Natural & Untreated. This gorgeous gemstone ring will make a great addition to your fine jewelry collection. Total Gram Weight. Total # of Stones : 1 Cut : Oval. Color : Green Clarity : Clean. Ring Size : 5.5. Side Stone : Simulated(manmade). High Quality of Marquise Cut Australian Solid Opal in Rainbow Color. Eternity Ring Style 14K Yellow Gold Size 7. Free Gift Bag/Box with every order! 5 Natural Australian Solid Opal, Marquise, 0.65 ct.
14k Solid white gold Natural Sapphire & Diamond ring. Sapphire : 0.55 carat. All gold and Sapphire are 100% genuine. Not plated. Gold : 14k. Diamond : 0.02 carat. Clarity & Color: SI, Nice color. 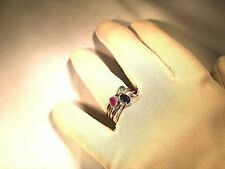 Round Multi Color Opal Filigree Sterling Silver Ring Free Sizing. This lovely Multi Color Opal ring is suitable for all occasions. Rings may appear to be larger than they are due to zoom technology. Oval Cut 4x6mm Genuine Natural Emerald with 10 1mm Diamonds Ring in 10kt Solid Yellow Gold. Size 8. Weighs 4.0 grams. Stunning and gorgeous ring! Gemstone: Black Onyx. Material: 10k Yellow Gold. Moonstone wt : 0.55ct. Diamonds Studs Gold diamond Rings Gold Diamond pendant Diamond Necklace. 14K Yellow Gold : 1.39 gm (Approx). Gemstone Information. Diamond Bracelet. This ring available in all three Gold (Rose / Yellow / White). This is a Beautiful, Rubellite Tourmaline / Sapphire Ring. 0.40ct Rubellite Tourmaline 6x4mm. 0.05ct Pink Sapphire 1.5mm. 0.05ct Blue Sapphire 1.5mm. 0.05ct Yellow Sapphire 1.5mm. 0.05ct Green Sapphire 1.5mm. For your consideration, a lovely. 69ct Round Faceted Aquamarine 925 Sterling Silver Filigree Ring. There is one gem quality. 69ct Round Faceted natural earth mined blue Aquamarine solitaire. It is VS in clarity. Both Alex and Moonstone are untreated gemstones; their beauty is a gift from the Earth. Moonstone and Alexandrite are both birthstones for those lucky people born in June. An uncommon combination of faceted genuine natural Rainbow Moonstone with genuine natural Alexandrite accents gives birth to a petite & fabulous. 925 Sterling Silver ring! Opal Cluster Ring in 14k Yellow Gold / Unique Diamond Stackable Ring / Diamond Two Ring / Unique Wedding Ring / Promise Ring / Graduation Gift. Rings - Wedding Rings, Gemstone Rings, Diamond Rings, Stackable Rings, Delicate Rings,Solitaire Rings, Chain Ring, Knuckle Ring etc. (10k Yellow Gold. 1) 4 x 6mm Natural Blue Topaz = 0.50ct. F/VS1 Natural Diamonds = 0.03ct. Ring Size Natural Stones Yes Natural, Not Enhanced. This gorgeous gemstone ring will make a great addition to your fine jewelry collection. This ring is set genuine Blue Saphirre 6mm in length 4mm in wdith. The round diamonds are 0.50ct. G,color SI, VS in clarity. Simon B Jewels. This ring will be presented to you in a gift box. thats right! IT IS 8.9MM WIDE ACROSS. FULLY HALLMARKED INSIDE. Australian Black Opal and Diamond Ring in 14k Yellow Gold. Free Gift Bag/Box with every order! Every Opal piece is Unique. You won't find two exactly identical opal gems because of their unrepeatable play-of-color. 10K Yellow Gold. 60 Ct Blue Topaz & Diamond Ring. Stamped 10K. Such a beautiful dark topaz! Topaz carat weight. 50. (Total Carat Weight is. 56cts. ♦ 3 x 7mm Ruby =. 36cts. ♦ 2) 2.0mm Diamond G-SI2 =. 06ct. ♦ 22) 1.2mm Diamond G-SI2 =. 20ct. Ring Size: 5.5 (Sizable) | Total Weight: 4.5 Grams | Not Enhanced. ♦ Ring Size: 5.5 (Sizable). & Ruby Ring 0.60 carats. All gold, Ruby and diamond are 100% genuine and natural. 14k Solid Yellow Gold Natural diamond. Ruby weight: 0.39 carats. Ruby Origin : Madagascar. Ruby Quality: Slight inclusions & Nice color. 2mm wide back of shank (most narrow area of band). Jewelry Type :Ring. 5mm wide ( front face of ring). 6mm high ( finger to top of ring). Accent Stones :18 matching Round Cut Diamonds. Color :Green. Weight: 0.36cts total approx. This gorgeous ring features a beautiful faceted green sapphire and two clear diamonds embedded in 14k white gold. The sapphire is. 54ct and the diamonds are. 04ctw. The band of the ring is an organic and intricate with a unique engraved pattern. Platinum, 10k, 14k, 18K gold is also available to customize. Center Stone - Natural Ruby. Carat Weight - Round Cut 0.50ctw. Diamond Jewelry. Color / Clarity - Red / VS. Side Stones - None. We Care about Your Dream, Your Love, and Your Own Taste of Jewelry Pieces. Ring is size 6 and can be resize by your local jeweler. Stamped 14K and weighs 3.62 grams.500 ct total weight. The inside of the band is ahallmarked "TCJI 10K" for 10K gold. The ring is a US size 4 3/4 and it's total weight is 2.5 grams. Diamond Color - G-H Clarity - I1-I2. Ring Approximate Height - 9.6 mm. We are proud of the joy and happiness we have provided thus far and hope to provide even more. Wholesale and Manufactures for over 40 years. The ring is a size 6.75, weighs 2.2 grams and is marked 14K inside band. The width of band is 1.4mm. Total Sapphire Wt. - 0.30 Carat. Sapphire Type - Natural. We have also introduced Diamond jewelry in 92.5 Sterling Silver. Our range includes Rings, Earrings, Pendants and Mangalsutra. Total Diamond Wt. One of Kind Shiny Boulder Opal. Natural Australian Boulder Opal, Pear Shaped, 0.67 ct. Every Opal piece is Unique. You won't find two exactly identical opal gems because of their unrepeatable play-of-color.